Contributors this month: Alfie Kohn, Marvin Marshall, Cheryl Sigmon, Marjan Glavac, Todd R. Nelson, Hal Portner, Leah Davies, Barbara Pressman, Tim Newlin, James Wayne, Alan Haskvitz, Bill Page, Amy Otchet, James Burns, Michael Olson, Stewart E Brekke, Barb Stutesman, Ron Victoria, Joan Masters, and YENDOR. A collection of noncompetitive and entertaining activities that will help your new students bond with each other, and with you! The following activities are noncompetitive, entertaining, and foster friendships among students. They help children to feel bonded to each other and to their teachers or group leaders. When students feel accepted and that they belong, they are more ready to learn. These activities may be adapted to various age levels and group sizes. At the beginning of the year, place objects in a white paper lunch bag that you have decorated with markers and your name. Place five or more objects that represent your interests in the bag. For example, a picture of your family, pet, favorite candy bar, needlework, picture of hiking boots, travel pamphlet, etc. As you take out each item have the students guess why you chose it, or tell a story about each one. Then give each child an "About Me" bag to decorate and fill with items representing their preferences and interests. After they are returned, provide an opportunity for the students to talk about their items. These bags provide the teacher or leader with valuable insight into each child's life. A variation is to show cut-out magazine pictures or to draw pictures on an overhead transparency that describe you. For example, a book, swimsuit, baby, etc. Pass out paper and have the children draw pictures or cut out pictures from magazines that represent themselves. Have them discuss their pictures. If the children are too young to write, ask them the questions and write all of their comments on a board. 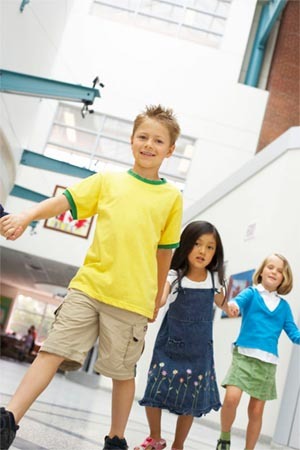 Ask the children to line themselves up by height, in alphabetical order by first name, or by birth date. When they have succeeded tell them how capable they are. Stress that by asking questions and working together they will be successful in your class. For a bulletin board entitled, "We Are All Different, Yet All The Same," have the children draw themselves on paper or their head on a paper plate. Provide a variety of markers, felt, yarn, construction paper and other materials for use on their self-portrait. You may have older students fill out a questionnaire or list two goals for their school year to be displayed with their picture. Divide a sheet of paper into 8, 12, 16 or 24 sections. On each write something like: has a big brother, has a little sister, was born in another state/country, likes mushrooms on pizza, likes to read, has a relative named John, has a pet bird, loves horses, watches (name of show) on TV, does not have a TV, broke leg or arm, likes to ice skate, plays basketball, likes to fish, wears glasses, has a summer birthday, plays the piano, first name begins with "M," etc. Pick phrases with your students in mind. Some children would relish the extra attention they would receive, i.e. born in a foreign country, or a shy child whose name begins with the chosen letter. For children who do not read, draw a picture in each space and discuss what each means. For example, a dog would mean that the child has a dog or likes dogs, a cat, a baby, a big brother, a fish, an arm with a cast, glasses, roller skates, baseball, etc. If the children cannot write their names small enough to fit in the section, have them print their initial in the space. Pass out the sheets and have the children walk around the room and get a signature from someone who fits each description. An individual may only sign a child's sheet once. You could also read each child's statements and have the other children guess the author. Older students may enjoy adding more statements, one of which is untrue -- for example, "My dog had ten puppies." The children then guess which of the statements is false. Afterwards, combine the children's pages to make a class book. Have the children sit in a circle. Ask each child to introduce himself or herself by saying his or her first name and a descriptive adjective or phase that begins with the same letter of their name, i.e. Friendly Fran, Very Happy Van, Strong Sam, or have them name a food they enjoy eating that begins like their name, i.e. Pizza Paul or Apple Anne. Younger children may need help thinking up a adjective or food to go with their name. The teacher or group leader begins and sets the tone of acceptance and fun. Have the children repeat the name of the child sitting next to them, before they say their special name, i.e. "This is Friendly Fran and I am..." If you have a small group, some of the children may be able to memorize all the names and then repeat them around the circle. Have the children stand in a circle. Using a large ball of yarn, begin by holding the end of the yarn and naming someone across the circle along with saying something kind about a child like, "Tom plays fair." Then toss the ball to the student who says another child's name and makes a positive comment about him or her before tossing the ball of yarn. The ball is tossed around the circle weaving a "web" until the yarn is totally unrolled. The teacher or leader comments that everyone in the group is important and belongs. This activity contributes to group cohesiveness and a feeling of acceptance and self-worth.